Strong low-end torque: The DOHC liquid-cooled parallel-twin engine uses a square bore & stroke of 67 mm x 66.8 mm for an optimum combination of strong low-end torque and horsepower and excellent top-end performance. Prior year model shown. Smooth and compact: Engine vibration is kept to a minimum by using crank pins phased at 180 degrees and a balancer shaft behind the cylinders, which also contributes to the engine's compact size. 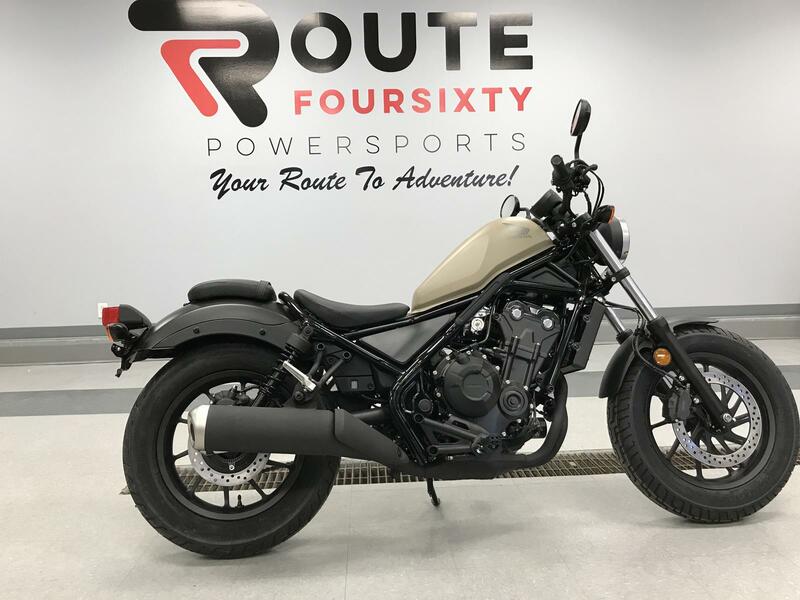 Cruising power: Honda engineers tuned the Rebel's engine and exhaust system to perfectly suit the cruiser riding style, resulting in strong low-end torque, a wonderfully smooth powerband, and an ear-pleasing sound. High-tech design: A light and compact roller-rocker-arm assembly and shim-type valve adjustment allows a lower valve-spring load for reduced friction and a compact cylinder head. And to ensure precise cylinder shape, the engine uses the same centrifugal-cast thin-wall sleeves as found in the CBR600RR. Crisp throttle response: PGM-FI electronic fuel injection keeps the engine running efficiently in all conditions and ensures crisp throttle response. Prior year model shown. 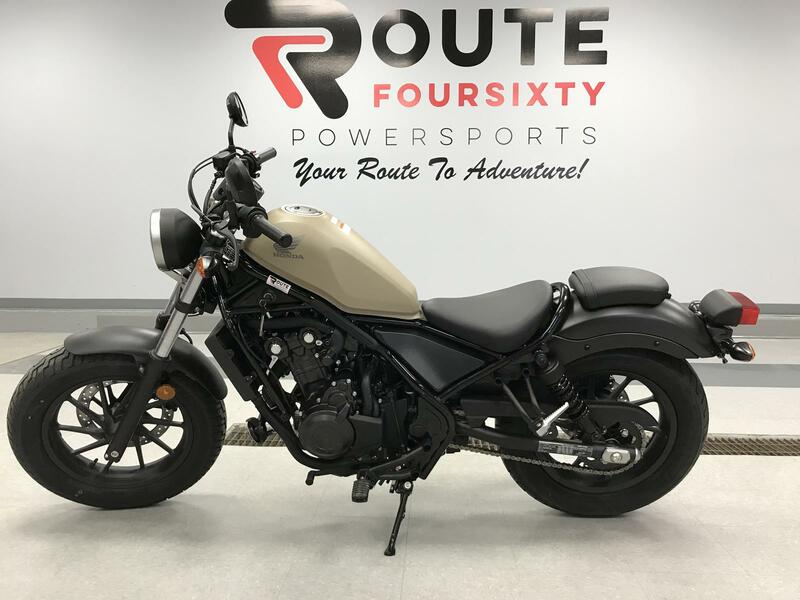 Sure shifting: The Rebel's six-speed transmission works in concert with the engine's broad powerband to make getting going from a stop easy, while also ensuring strong performance and excellent fuel economy during highway cruising. Prior year model shown. Distinctive chassis design: Combining elements of bobber and chopper styling in its iconic fuel tank design, narrow frame, raked-looking front end and black-out components, the Rebel has a raw, no-nonsense appearance that's bound to get noticed. Prior year model shown. Comfortable seat height: The Rebel's low 690 mm (27 in.) seat height allows most riders to easily put both feet flat on the ground at stops for added confidence. Want to bring a friend along? The optional passenger seat installs easily. Prior year model shown. Bold, oversize tires: Oversize tires (130/90-16 front; 150/80-16 rear) help to contrast the narrow frame and add to the Rebel's strong, confident stance. Prior year model shown. Available ABS: Front and rear disc brakes provide confident stopping power, or step up to available ABS for the ultimate in braking performance and peace of mind. Retro look, modern handling: Dual side-mount shocks and the raked-looking fork provide a retro look, but thoroughly modern comfort and handling. Prior year model shown. Ample range: Chopper-style fuel tank looks compact, but its 11-litre capacity combines with the engine's excellent fuel efficiency to let you ride far and wide between fill-ups. Prior year model shown. Side-mounted key: The side-mounted key location adds to the Rebel's retro character. Prior year model shown. LCD instrumentation: LCD instrumentation keeps you up to speed on your progress and the engine's operation. Prior year model shown. Customize your Rebel: A collection of custom-designed Honda Genuine Accessories—including windscreen, saddlebags, rear carrier rack, and more—let you create a Rebel that's uniquely your own.